The days before Easter Sunday are hellish for supermarket workers in Italian-American cities such as Chicago, Philadelphia, and Providence. That's because every Italian woman, whether practicing Catholic or not, will be storming her local supermarket to purchase an obscene amount of eggs. (My mom used to buy between 12-15 dozen every year.) Lord help the poor dairy manager who runs out of eggs. It's a sight to see. A gaggle of women trying to box one another one, in an effort to select the best eggs. It's the older Italian ladies who are most successful; they have honed their skills over the years. After all, they need to stockpile eggs. How else will they make deviled eggs, braided sweet bread, sausage bread, and a host of pies? Every Italian Easter table will have one or two savory pies, such as pizza chena (meaning "full pie"), a massive two-crusted pie filled with eggs and various Italian meats and cheeses and pastiera Neopoletana, a time-intensive pie made from ricotta cheese and soaked wheat kernels. The jewels of the Italian Easter table, however, are the sweet pies, namely custard, ricotta, and rice. Custard pie should be dense, creamy, and mile-high. 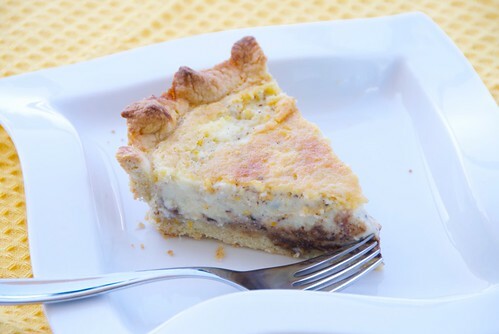 Italian ricotta pie (torta di ricotta), an Italian cheesecake closely associated with Easter, is typically laced with citrus flavors but can also be made with nuts and/or chocolate. Rice pie (torta di riso), which is served only at Easter, is like a cross between rich ricotta pie and creamy lemon panna cotta (an Italian cooked cream). It is made with eggs, rice (usually arborio), ricotta cheese, and citrus (usually lemon). It tastes best on the Monday morning after Easter for breakfast. Since Jeff and I won't be in Rhode Island for Easter this year, I wanted to have a taste of Easter in San Diego. There are only two of us, so I had to be selective. 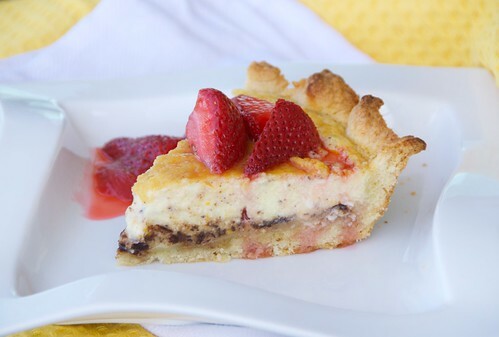 I chose one traditional pie, Italian rice pie with lemon, and one with a modern twist, Chocolate-Orange Ricotta Pie with Sambuca Spiked Strawberries. Rather than make my grandmother's famous Italian Ricotta Pie with Pineapple, I wanted something a little different this year. Instead of pineapple, I added orange zest and melted chocolate, a pleasantly sweet and citric combination. As the ricotta cooks it seeps into the bottom crust making it almost cake-like, while the edges retain a satisfying flakiness. Each serving is enhanced with a topping of sambuca spiked strawberries. The sambuca's mild anise flavor highlights the natural sweetness of the strawberries and pairs beautifully with the creamy ricotta. I just looked at the clock. It's 7:53 am, so I've gotta run. I want to be at market when it opens at 8am and the shelves are fully stocks with eggs. I'm not taking any chances. After all, San Diego has a sizable population of Italian women. 1. For the crust, combine flour, sugar, salt, and baking powder in the work bowl of a food processor fitted with a metal blade; pulse several times to combine. Add the butter and pulse about 10 times until the dough becomes pebbly in texture. Add the eggs and pulse repeatedly until the dough begins to stick together. Slow add the ice water by the tablespoon, while using a few long pulses. Add more drops of ice water as necessary, until the dough holds together well. Invert the dough onto a floured work surface. Form a ball and flatten in a disc; wrap the disc in plastic wrap, and refrigerate while preparing the filling. You can keep the dough in the refrigerator for up to 2 days before continuing. 2. If you don’t have a processor, then combine the dry ingredients in a bowl; add chunks of chilled butter, and using a pastry blender or two forks, chop the butter until it resembles little pebbles. At this point, add the eggs and ice water, and stir with a spoon until the dough begins to form. Using your hands and working the dough as little as you can, form a ball, and transfer it to a lightly floured surface. Knead until the dough holds together. Form the dough into a ball, wrap in plastic, and refrigerate while preparing the filling. You can keep the dough in the refrigerator for up to 2 days before continuing. 3. To make the filling, add the eggs, sugar, orange zest, and cointreau to a large bowl. Using a hand-mixer on medium-low, mix until well combined. Add the heavy cream, cornstarch, and cinnamon, and beat on low until well combined. Stir in the drained ricotta and melted chocolate, and mix with a rubber spatula until well combined. Place bowl in the refrigerator. 4. Place a rack in the lower third of the oven and preheat to 450 degrees F. Coat your pie plate with cooking spray. Turn out the dough onto a lightly floured surface and roll into a 10- inch circle. Transfer the dough to the prepared pie plate, gently pressing it into the bottom and sides. Prick the bottom of the crust a few times with the tip of a fork. At this point, set the crust in the freezer for about 15-20 to get it really chilled, which will make for a flakier crust. 5. Remove the chilled crust from the freezer and pour the filling to about 1/4 of an inch below the top of the crust, as it will puff up slightly when baking. 6. Bake at 450 degrees F for 15 minutes, then lower the temperature to 325 degrees F and cook for 25 minutes, or until the filling puffs up, turns golden, and is “set,” meaning it should not be jiggly when you gently move the pie plate. Remove from oven and let cool on a rack. Serve at room temperature or chilled. 7. For the strawberries, bring water and sugar to a boil in a medium heavy-bottomed saucepan. Lower the heat and simmer for about 8-10 minutes, or until the sauce begins to thicken slightly. Add the strawberries and cook 2-3 minutes, or until soft. Turn off heat and stir in sambuca. Cool slightly before serving. If not using immediately, re-heat slightly if the syrup hardens. Note: If you have some extra filling left over, you can pour it into a small baking dish or ramekin for a crustless version. Just reduce the baking time. Looks yummy! We're not cooking this year thankfully (as we're out of town) but are excited to join a friend. Perfect spring dessert. I love chocolate and orange together. Another gorgeous Italian recipe that I, tragically, have never had. Definitely going on the to-try list! Yum! Totally sharing this with my friend who is looking for another dessert to make for Easter. Oh Susan, how gorgeously yummy is this?!! I can almost feel it cool and creamy on my tongue. Delish! Oh, my mouths is watering! This pie looks divine! I'd love to be in Italy during Easter because all the food sound wonderful!! I always love the weeks before Easter when you share so many fantastic ideas for Easter pies. Thanks, Susan! Funny story! I could picture the scene in my head! Love the pies yum! Looks very, very good! I have printed out the ricotta pineapple pie you have on your blog and may try this for Easter. I have wanted to make it for about a year now and just have not gotten around to it! I like the idea of chocolate and orange. Those two flavors are so good together. I will have to try this. I've never seen anything like this before, looks delicious! Happy Easter! I must have ADD, I got all excited when I saw pineapple ricotta pie. That sounds PHENOMENAL. But this chocolate-orange version? Also crazy delicious. Must have a slice now!! Why wasn't I born Italian??? This looks amazing. Lucky you to have such marvelous bakers in your heritage. But 12-15 dozen eggs? Seriously??? Hope you have a wonderful Easter! That's a lot of eggs! I had no idea! But I think it's kind of awesome, really. The pie looks lovely for summer, too! Happy Easter! Wishing you a very Happy Easter Susan! It looks delicious. Strawberries with sambuca-yum! You had me at "ricotta," and then it just got better. Wow, this sounds like a perfect treat. I hope you had a wonderful holiday. I'm now off to check out this rice pie...never had anything like it before and I'm intrigued! unplanned cooking-I hope it was happy! snooky-I was surprised at how well they went together. cara-That's awfully sweet of you. Thanks! sari-I'm happy to hear it! tw-I love sharing the stories and recipes, and I'm thrilled you enjoyed reading them. tasteofbeirut-Now that's what I like to hear! debbie-Better late than never, right? Hope you like it! valen-Well I hope it has piqued your interest. lynn-Yes! That is not an exaggeration. Have you been to an Italian Easter Sunday feast? It's unbelievable! joey-Happy belated Easter to you as well! tastyeatsathome-Rice pie is my favorite of all. I tried the ricotta pie with pineapple for Easter and we really enjoyed it. Thanks for sharing the recipe. I hope your family in Rhode Island is safe and dry. linda-I'm so happy your family enjoyed it. We all love it so much. Thanks for your concern about my family too. They're definitely drying out. Love your blog, by the way. I meant to make your blueberry-twist on cinnamon rolls ages ago, but I used up all my blueberries. They're just too delicious to pass up as a snack!! This ricotta recipe looks amazing! your blog is excellent! very inspiring, recipes, I am so glad I found it!